Hmmm, the ES-295 looks strikingly similar, and debuted in '52. LOL!! And? I'm still not sure of the point of all this--digging out florentine cutaways (which nobody would claim as the innovation of the LP--cynical claimed the Rhoads V was like the Les Paul as a signature guitar because its... polka dots... didn't hitherto exist..so now we're onto cosmetic subtleties). On the signature discussion, I have a sentimental soft spot (not just because of the greatness of the signatory) for the JB's, because they're turning into the last vestiges of those great 80's set necks (and later neck thru) that put Kiesel/Carvin on the map, and those in depth switching options. Also because the money from each purchase funds his well being and care. I'd happily play a Holdsworth or a JB. Doctor Turn wrote: Not really buying that. Those are tiny nuances of shape of a preexisting guitar, which itself was based on another pre-existing guitar. The LP was completely new never played by anybody beforehand. 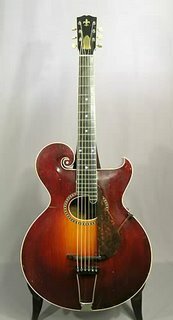 1925 Gibson. Basically a Les Paul. THAT'S what you reach for to show that there was a similar shape to a Gibson Les Paul? Dude you could have saved yourself the trouble and posted a telecaster! I was waiting for for it and at least it's a solid body!! I think you need to turn your sarcasm detector up a notch. I had a feeling you were screwing around, but sometimes (see the Cow above who is clearly serious) I can't be sure with some of the responses I get from people. But my apologies. I thought you might be.. but I've seen worse with stone seriousness! Doctor Turn wrote: I had a feeling you were screwing around, but sometimes (see the Cow above who is clearly serious) I can't be sure with some of the responses I get from people. Unless I'm not (being serious here). You're misunderstanding what I'm saying here. What I'm saying is that the Rhoads V is like the Les Paul in that the guy who it's a "signature model" of didn't get famous while playing it. The flying V that Randy Rhoads was most associated with was not the Jackson Rhoads V (in fact, it wasn't a Charvel/Jackson at all). I think he means this V. The shape has attracted lots of metal dudes over the years. I fully understand what you're saying, but you're missing my point: the fact of whether the one he originally played had polka dots or symmetrical vs unsymmetrical doesn't mean he didn't play that kind of guitar that became his signature. He still played a V. The fact that what became his signature has slight cosmetic differences--this doesn't mean he never played a flying V. He previously played a guitar that was just like it. And you're free to think the symmetry and the dots make it an entirely new guitar--which to me was what the Les Paul was: an entirely new guitar, especially vs the Fenders (and doubly so 5 years in when Lover developed the humbucker). There was nothing like it, like the Rhoads V was still like V's previously available. We just differ in our opinion on what consititues "new guitar." And that's okay, gents! Had to share this major "Whoa!" Thank You for sharing! I love it. "What a crappy bookmatch the lines don't even line up." I kid, i kid...that's stunning! The way the figuring lines seem to continue on into the grain lines in the other piece of wood make it look like the matters are crossing and overlapping. That is one-in-a-million top, right there! Doctor Turn wrote: Had to share this major "Whoa!" A Kiesel CS with approx. the same specs and "Jeff's choice" top would probably run around $4K, based on (for example) the one-piece crosshatched CS from a couple NAMMs ago. Any one have a clue as to what the Evil Empire wants for this beauty? I'll be shocked if it's less than twice that. I think I saw it on Pin, just a photo w no specs or pricing. Maybe try a reverse image search? Doctor Turn wrote: I think I saw it on Pin, just a photo w no specs or pricing. Maybe try a reverse image search? I tried, no dice. Similar ones run like 7k on GC or MF. You can definitely see that it's an "R" (I doubt it's a legit vintage article.. that top would have been featured on a thousand Gibson books) owing to the ABR and what looks like some murphy aging. I wouldn't be surprised if it's up in the $7-9k territory. That's an extraordinary top even for Kiesel, and when Gibson has something it knows is so droolworthy, they really play it up and charge a fortune. One thing Gibson of today has no problem doing, and doing to excess, is Self-Celebration. First peek at the 2019 Standards.. I agree, cool electronics. I hate to say it, I may need to check out these new G LP's. Some of the this LP's settings remind me of the options I have on my 80's DC. Mark had mini toggles for dual/single coil and phase.